A LISBURN artist had the chance of a lifetime to study abroad in May 1972, however she was hoping that a lack of funding wouldn't ruin her dreams. Former Friends' School pupil Beverley Parke was accepted to study at the Academy of Art in Harlem, near Amsterdam in Holland. However, as she had not been able to obtain a grant, the loca. girl was hoping to receive sponsorship for the course. Beverley had studied painting or four years at Belfast College of Art, and was in her fifth year, here she was also teaching part-time. The first student from NI to be chosen to study at the Academy of Art in Harlem, which accepted just 40 - 45part-time students each year, Beverley's Dutch studies would see her concentrate on two of her favourite artists, Vermeer and Van Gogh. WAR-TIME memories were revived in Lisburn in May 1985 when the 40th anniversary of the liberation of Europe, VE Day, would be celebrated. Veterans who fought to achieve victory over Nazism would parade through the town for a special wreath-laying ceremony. The parade and a Beating of Retreat ceremony would take place in Smithfield Square, organised by the Royal British Legion. The Lisburn Old Comrades were invited to a Belfast event and decided that Lisburn needed a celebration. An old picture of Downshire Football team from our records. THE Chamber of Commerce in Lisburn protested "in the strongest possible terms" in May 1966, against the complete withdrawal of banking facilities for an indeterminate period of time because of a bank workers' strike. In a strongly worded letter to local bank directors, the Chamber called for at least a partial banking service for the business community. Failure to provide such a service, the Chamber claimed, indicated that banks had little or no concern for the interests of their customers. The letter asked whether the banks envisaged restoring a restricted service for lodgement of cash and the payment of sums for wages in the event of the strike being prolonged. The letter stated: "While the Chamber is disinterested in the merits or demerits of the strike, it firmly believes that it is the duty of the banks to strive to maintain a partial banking service for the business community, and that failure to provide such a service indicates that the banks have little or no concern for the interests of their customers." A FORMER Lisburn man spoke to the Star in May 1999 after he was caught up in terrifying tornadoes in the United States. Ronald Keith, who was originally from the Saintfield Road, a microbiology researcher at Oklahoma State University, said he had never seen anything quite like it. In all there were 76 tornadoes recorded across the Midwest, ripping across towns and villages, leaving 50 dead and 700 injured. Ronald and his wife Lisa were at home in the town of Stillwater when the warning sirens sounded around midnight. The pair had to get into their tornado shelter in their home and bury themselves underneath pillows and blankets. "It was quite frightening," said Ronald. "We had seen a lot of television coverage about the tornadoes and had kept a watchful eye on events. But it was still a shock to hear one was heading for Stillwater. "It was like something that you would have seen in the film Twister. The most frightening thing is the way they just ripped through destroying towns and villages. Ronald's family back home in Lisburn had an anxious wait for news but were delighted to find out he was safe. 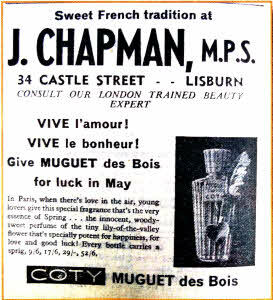 Love was in the air back in 1958 when the Star advertised Muguet des Bois the sweet French perfume on sale at J. Chapman, MPS, Castle Street in Lisburn. 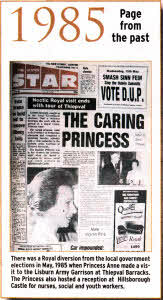 There was a Royal diversion from the local government elections in May, 1985 when Princess Anne made a visit to the Lisburn Army Garrison at Thiepval Barracks. The Princess also hosted a reception at Hillsborough Castle for nurses, social and youth workers. A GROUP of schoolgirls from Fort Hill felt so strongly after watching a TV programme on Vietnam in May 1969 that they immediately sprang into action. The girls watched with horror, the programme depicting war atrocities to which many Vietnamese children were subjected. They baked cakes to sell at break-time to raise funds for children affected, before presenting a cheque for £9 10s to save the Children. LISNAGARVEY Hockey Club had another grand day in May 1958 when all four teams recorded victories and two of them brought home cups to add to the already impressive silverware of the Garvey side-board. 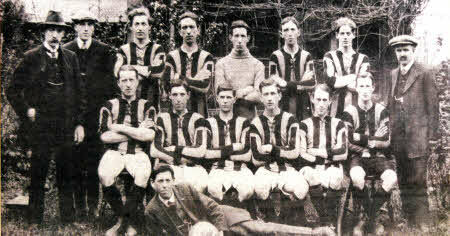 The Seconds retained the Intermediate Charity Cup, whilst the Thirds won the Junior Charity Cup.